Thanks to the shittiest cold ever, I (Kate) have been downing some Nyquill to help me snooze...and last night I had a crazy dream about Chinese Ballroom. I dreamed we were having a show, and we didn't warm up before stepping on stage (gasp!!!). 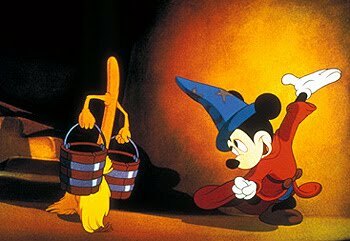 For our first game we played freeze in a line, like we always do, but for some reason we decided we would play the movie "Fantasia" behind us, and when "freeze" was called, we would literally freeze the movie and the next person would have to adopt the freeze of one of the animated characters, then start a scene. Well, everything was going swimmingly until it was VINCE'S turn to call freeze, and he let the movie play and play and play to the point where the rest of the team was whispering "CALL FREEZE!" and he was laughing, but the audience was obviously very bored just sitting there watching Fantasia...and then the movie got to the end of the tape and we hadn't even finished the game yet!! The entire team was oh so mad at Vince. I realize that other people's dreams are never as interesting, but I thought I'd give it a shot by blogging about it. Does that make in any more interesting? By reading it on a blog? Anyway. Thanks for reading.